Haristobald Photography: Sea Shepherd's speedboat: the ''Brigitte Bardot''. 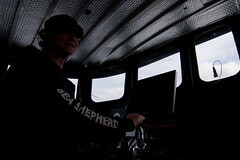 Sea Shepherd's speedboat: the ''Brigitte Bardot''. Version française à la fin du post. I know the Sea Shepherd foundation for a few years now. The first time I saw their actions, I've been realy impressed! 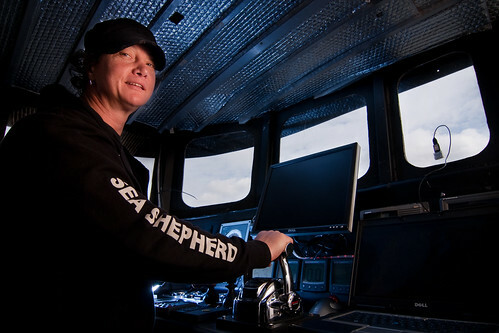 The Sea Shepherd company was created in 1977 by a certain Paul Watson, one of the Green Peace Foundation's founders. He found then Green Peace too soft and too political so he decide to go for more action. And he did. The more impressive and spectacular actions they did was the ramings of illegals whalefishing boats. They also sunk a few illegals boats but without ever causing any human casualties. They use to call themselves ''legal pirates''. As Paul watson says: you only can fight pirates with pirates! I kind of admire the Sea Shepherd and the guys doing the job. So when we saw that one of the most amazing boat of the Sea Shepherd's fleet came to Belgium, the ''Brigitte bardot'', I couldn't resist to visit it an go take some pictures of the boat an his captain. It wasn't difficult to find the captain in the boat, it's so small, there is no place to hide in there. His name is Johnny Cunliffe and he was working on his computer before we started taking about his boat and job. The man is amazing, humble and pasionate by his mission. Former skipper, he left everything two years ago to live an adventurous life serving wildlife. But let's talk photography, all the info you wants about the organisation can be found on the Sea Shepherd's Website. The first picture was take on the deck, in front of the boat. Kinga was holding an 580 EX with a 1/4 CTO on it triggered by PocketWizzard. I was laying down on the pier with a 12-24, as low as possible to avoid any harbour buildind in the frame. The flash alowed me to light Johnny's face when the global exposition was mesured on the sky. After that I just had to add light. Main light was given by a 580 EX camera right, used with a shoot-true umbrella and 1/4 CTO gel all that hold by Kinga who is a wonderfull VALS (Voice Activated Light Stand). Then I placed a SB-26 behind Johnny with a blue gel and a dome diffuser on it to give something to the interesting background. Sea Shepherd is a non profit organisation but like everything, they need money to function. Most of the crew members are volunteers but they need food, gas and material to do their job. The maintenance of the boats is also a big money eating challenge. 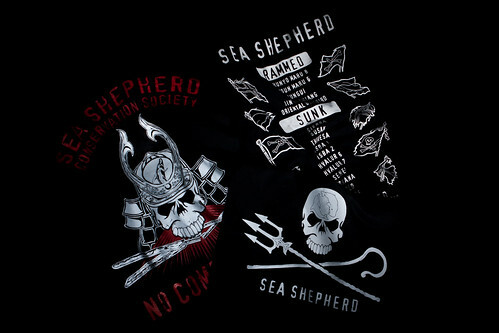 Because Sea Shepherd doesn't want to do agressive money begging campaign, they only live on donations and by selling T-shirts and merchandising products. Here below is the picture of the two T-shirts and the bag we bought on the boat. Three flashes where used for this picture. One low left, one low right, both with home made honeycomb grid, an an third one on-camera with a ray-flash as ringflash to lighten the shadows. The fabrics where specially placed so that the logos can catch the lights an give depth to the picture. La fondation Sea Shepherd est une organisation de présevation des océans et de la faune marine sans aucun but lucratif. Le fondateur de Sea Shepherd (le berger de la mer en français), Paul Watson, est également l'un des fondateur de Green Peace. En 1977, il crée Sea Shepherd car il considère que les actions que mène Geen Peace ne sont pas assez radicales. Depuis, Paul Watson s'est rendu célèbre par ses actions spectaculaire menées contre les baleiniers illégaux dont il a coulé et ''rammé'' une bonne quantité. Etant un fervent sympatisant de la cause défendue par le sea Shepherd, je ne pouvais manquer de visiter le ''Brigitte Bardot'', fleuron de la flotte de Paul Watson, qui était amaré à Anvers pour quelques jours. Lors de la visite du bateau, nous avons eut la chance de rencontrer Johnny Cunliffe, le capitaine du Brigitte Bardot. Personnage attachant et éminemment sympathique, Johnny nous a expliqué en long et large le fonctionnement de son bateau, la vie en mer et ses différentes missions autour du monde. Il a sans problème accepté de poser pour mon objectif. La première photo de ce post est prise sur le pont, à l'avant du trimaran. Kinga tient un 580 EX en main alors que je suis couché sur le quai, au ras de l'eau. La vue contre-plongeante me permet de supprimer les bâtiments environants de mon cadre. La seconde photo est prise au poste de pilotage. J'ai comme d'habitude réglé la vitesse d'obturation et l'ouverture pour obtenir juste ce que je voulais de lumière ambiante. En l'occurence ici je voulais garder les reflets sur les commandes du bateau. j'ai ensuite rajouté un 580 EX avec un parapluie translucide et un gel 1/4 CTO à droite et un SB-26 muni d'un gel CTB (bleu) et d'un dome diffuser juste derrière Johnny afin d'éclairer l'arrière plan dans toutes les directions.